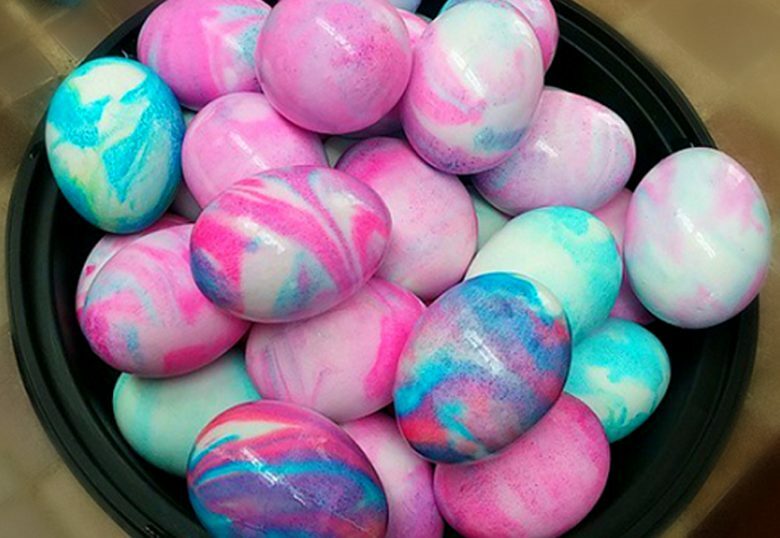 So, we’ve saved you the time, effort, and disappointment with these easy to follow egg-dyeing techniques. With just a couple of steps and ingredients required, these simple and effective ideas can be created by any kid (or adult) looking to get creative this holiday. 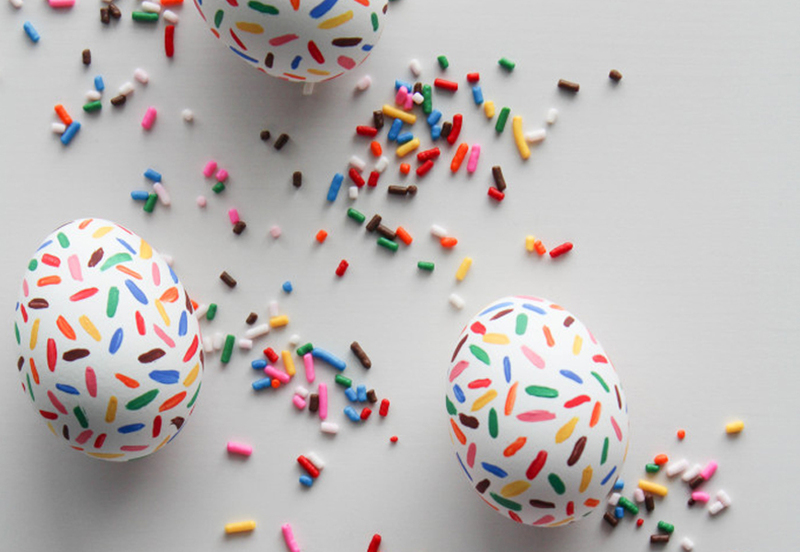 Try one of these new and fresh egg decorating techniques to excite your kids and liven up the Easter party. Your kids will love getting involved with this Easter craft because these beautiful and brightly-coloured eggs are fun, easy, and quick. Once the hard-boiled eggs are cool, simply wrap them in paper towel and dab on food colouring. Finish off by spraying with water and unwrap to find a uniquely designed egg inside. Tip: don’t forget your gloves or else your hands will be as dyed as your eggs! Because who doesn’t love sprinkles? Sprinkles always make everything better. All these eggs need are a thin paint brush and paints that mimic sprinkle colours. Now all you need to do is start adding small lines to your egg canvas. This technique is great for both kids and parents because it can be as messy or as precise as you want. The final result is adorable, colourful, and absolutely perfect for your Easter basket. 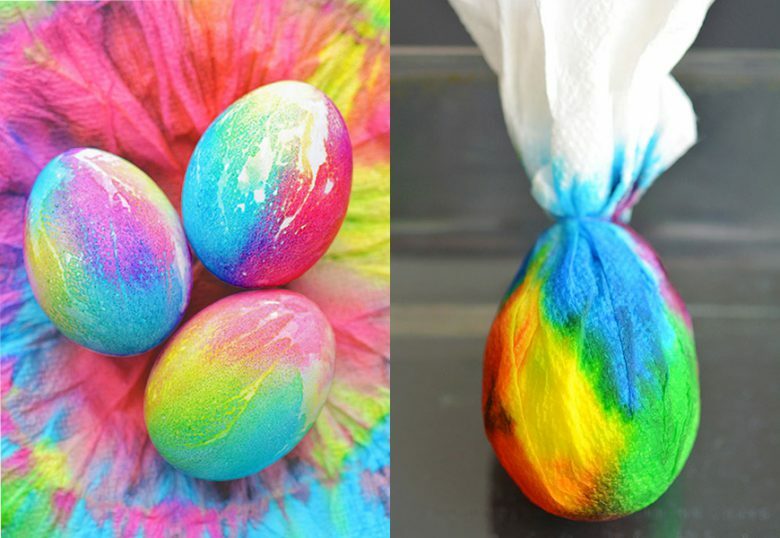 An alternative to traditional egg dying, this activity will be sure to get your whole family in the Easter spirit. Have the kids dip their pieces of bleeding tissue paper in water and go wild with covering their eggs. 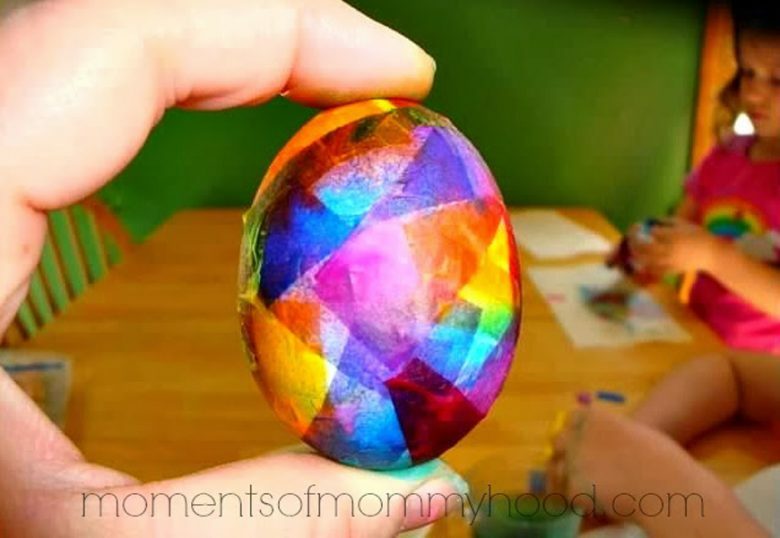 Once dry, peel the pieces of tissue paper off and you’re left with a one-of-a-kind Easter creation. Kids always manage to get into mom or dad’s toiletries at some point in their childhood, so we know they’ll absolutely love this shaving cream inspired egg pattern. Start by dumping the shaving cream in a tray, add drops of your favourite food colouring, and spread around with a straw. Next roll the eggs around in the mixture and let sit for 10 minutes. Once the eggs are rinsed you’ll be left with the coolest tie dye designs. 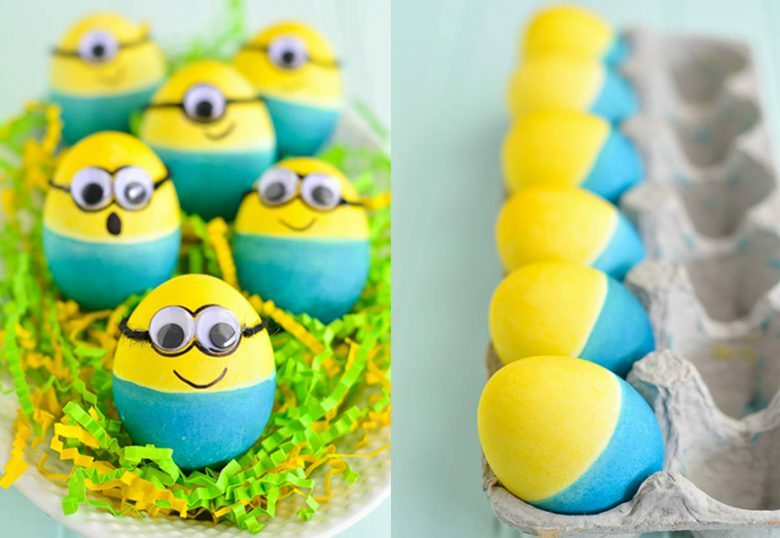 Invite the minions to your Easter celebration this year with this cute and creative craft. Begin by dipping one half of the egg in yellow dye, and the other in blue. Once they’re dry, glue the eyes and black string on. Complete the look with a marker-drawn mouth. Both you and your new minion friends will be giggling with excitement for Easter to come.